Funeral Cover for Extended Family | Funeral Cover ME - Get Covered! In modern South-Africa, there are many families that have only one bread winner. Unfortunately, this is something our economy has forced upon many of our people. In some cases, a single bread winner will have to take care of extended family. If you as a breadwinner need to take care of your family, it’s important to get funeral cover. 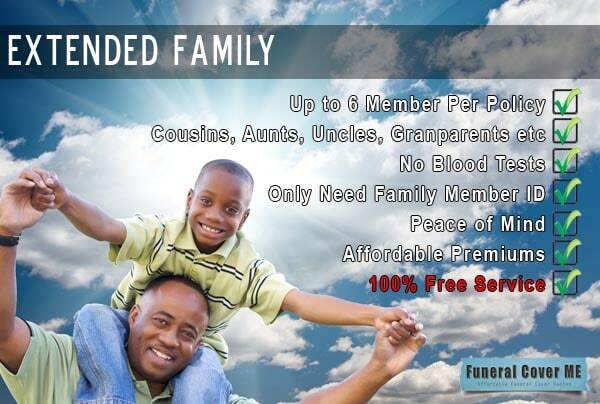 Getting funeral cover for extended family can definitely help financially in desperate times. Regardless of the size of your family, we will do our best to assist you in finding the best funeral cover quote for your specific needs. Extended family can range from uncles, aunts, nieces, cousins, nephews etc. This is all people you can include on your policy as extended family. If you have adopted children, they will fall under the normal child benefit. On many funeral policies, you will be able to cover as much as 6 extended members per policy. Always bear in mind that your parents will not fall under the extended family section. You can usually include your parents and your spouse’s parents under the normal family section. This gives you extra slots for other family members. Always remember, you do not have to be married to include your partner. You can include your boyfriend or girlfriend as a spouse. You can also include all of your children under your funeral plan. There will be no blood test or medical examinations required for any of your extended family members. They will, however, have to wait the standard 6 month waiting period for natural causes. This waiting period will not be required for accidental death. When you add a spouse to your funeral plan, they will be able to add their parents. There are many available options when looking for funeral cover for extended family. There are always ways to accommodate your family. Getting funeral cover for extended family might be the responsible thing to do. Let us help you include all your loved ones.